Dr. Meo is a certified Contemporary Medical Acupuncture Provider, with accreditation from the University of McMaster Health Sciences Department. 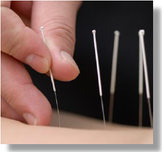 Contemporary Medical Acupuncture is a precise peripheral nerve stimulation technique, in which fine solid acupuncture needles are inserted into anatomically defined neurofunctional sites. The needles are then stimulated either manually or with electricity for the therapeutic purpose of modulating abnormal activity within the nervous system, the endocrine, exocrine, and/or immune systems, pain syndromes, functional problems, and any conditions in which these modulatory mechanisms are available. Neuromodulation occurs through neurological and neurohumoral mechanisms at multiple levels of the nervous system, namely the peripheral nerves, the spinal cord, the brain and brain stem, and the cerebellum.